WASHINGTON (Reuters) – The U.S. Supreme Court on Tuesday let President Donald Trump enforce his policy barring certain transgender people from joining or staying in the military as the justices put on hold lower court rulings blocking the plan on constitutional grounds. The conservative-majority granted the Trump administration's request to lift injunctions issued by federal judges against the policy while a legal challenge continues in lower courts. Liberal Justices Ruth Bader Ginsburg, Stephen Breyer, Elena Kagan and Sonia Sotomayor said they would have kept the injunctions in place blocking the policy. 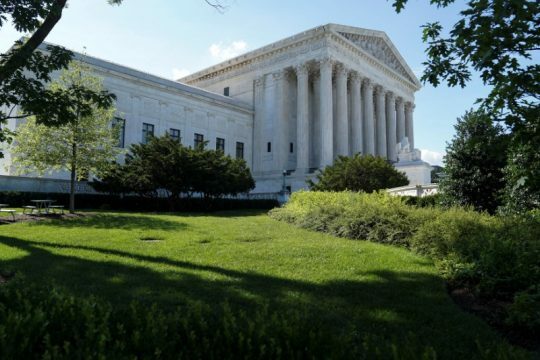 The justices refused the administration's request for them to decide the merits of the legal fight even before a California-based federal appeals court already considering the matter is given a chance to rule. Trump, whose administration also has taken other steps to limit the rights of transgender Americans, cited the "tremendous medical costs and disruption" of having transgender military personnel. Trump in March 2018 announced he would endorse a plan by then-Defense Secretary Jim Mattis that replaced the ban on all transgender people. The revised policy would ban the service of transgender people who seek or have undergone gender transition steps. It also would ban under certain circumstances transgender people who experience gender dysphoria, a condition the American Psychiatric Association defines as clinically significant distress due to "a conflict between a person's physical or assigned gender" and the individual's gender identity. Federal courts blocked the administration's policy, finding that it likely violated the U.S. Constitution's guarantee of equal protection under the law. Various injunctions allowed transgender troops to join the armed forces as of Jan. 1, 2018. This entry was posted in Issues and tagged Donald Trump, Military. Bookmark the permalink.